As an alternative to radiography, a field-proven mech-anized ultra-sonic inspection system is dis-cussed. Called Rotoscan, this system has been developed for inspection of girth welds during construction of long-distance pipelines, both on- and offshore. The system is characterized by high inspection speed and instant recording of results. Unlike prevailing radio-graphy, it provides immediate feed-back to the welders. Recent technical improvements in flaw sizing and recording have allowed the applica-tion of reject-ion/acceptance criteria of weld defects based on frac-ture mechanics. The develop-ment and actual use of such modern acceptance criteria, particu-larly in Canada, supported the introduc-ti-on of mechanised ultrasonic inspection. World wide applications proved that, contrary to expecta-tions, ultra-sonic inspection does not lead to higher weld repair rates than radio-graphy does. 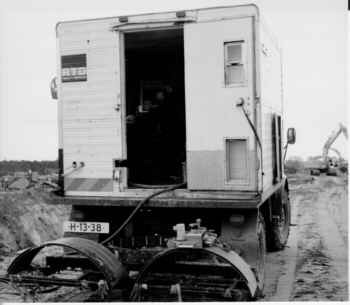 Between early 1989 and now, over 5.000 km of pipe-line (300.000 welds) were inspected with Rotoscan and its reliability proven. Introduction of C-scan mapping enabled the sys-tem to cope with most existing ultrasonic pro-cedures and acceptance criteria, because of its capability to detect and quantify volu-met-ric defects. Moreover, the inte-grated simultaneous TOFD function enables defect height estimation. The present sys-tem is capable of achieving a high Probability Of Detection (POD) together with a low False Call Rate (FCR). In the meantime, the system has been qualified in various countries, for different customers and for a variety of weld processes, pipe diameters and wall thicknesses. Because of its features, the now mature the system has demon-strated its capabil-ities also for use on lay barges as an alter-native to high-speed radiography. During cross-country pipeline construction, day production rates of more than 120 girth welds are not unusual. On pipe laying barges operating around the clock production can be as high as 360 welds per day. Non-Destructive Testing (NDT) is an essential tool to verify the quality of girth welds. For decades, radio-graphic techni-ques were applied almost exclusively, but today it is recognized that mechanized UT can replace radiography. A growing number of pipeline owners, contractors and authorities now agree that, for relevant defects, ultrasonic inspection results in a higher relevant defect detec-tion probability than radiography does . However, the real breakthrough of mechanized UT on pipeline girth welds was induced by the introduc-tion of C-scan mapping and TOFD facilities in the Rotoscan, enabling detection, recording, rapid interpretation of all relevant weld defects in almost all weld types, as well as compliance with prevailing codes and standards. Full weld coverage in a single fast scan is achieved by placing probe sets on both sides of the weld, each probe taking care of a particu-lar weld zone and scan typically at 40/100 mm/sec. Figure 1 shows a cross sec-tion of a weld divi-ded in zones. Figure 2 shows a top view of this ar-range-ment. Details of the Rotoscan are described in reference  and . A combination of TOFD with common pulse-echo techniques as used in Rotoscan can offer unique advantages over the appli-cation of pulse-echo techniques alone. Apart from the capability of TOFD to size defects, it has also been demonstrated that its use can increase probability of detection, in particular for defects which are difficult to detect because of their unfavourable geometry or orientation. This provides a "safety net function". TOFD's sizing capabilities inherently offer the option to apply Engineering Critical Assessment (ECA) or Fitness For Purpose criteria. Moreover, TOFD is also able to quantify hilo, which no other NDT method is capable of. It was also established that for selected applica-tions even Rotoscan's pulse-echo tandem probes for inspection of the weld body can be replaced by TOFD, without compromising on POD and false call rate. This makes the probe arrangement much more flexible, and is especially advantageous in those cases where the number of welds to be inspected is limited. Thus, the inherent draw-back of an inflexible tandem probe arrangement can be overcome. This novel approach has in the meantime been implemented in a hyperbaric welding and inspec-tion system, to be applied for sub-sea tie-ins and weld repairs. This system is designed manufactured and operated by RTD on behalf of the habitat operator. As pioneer in the field of mechanised UT, RTD introduced the "go-no go" mode of recording allowing quick analysis of results. Only those signals exceeding a preset amplitude threshold were shown on a multi-channel record. The record also included distance marks to enable defect position and length measurement as well as acoustic coupling check. In 1989, an essential improvement was added, introducing recording of analog signal amplitudes and transit distances, particularly to improve interpretation in the root area and to differentiate between planar and erratic defects. Interpretation was still done from paper charts, which were also used for archiving. In 1993, computerized data presentation and storage were introduced. The use of a computer also enabled digitisation of ultrasonic signals, essential for coherent C-scan mapping and the use of Time Off Flight Diffrac-tion tech-nique (TOFD). The mapping facility offers the possibility of pattern recognition, which appeared to be the key feature for reliable inspection of welds with narrow roots (manual stick, narrow gap) as well as recognition and quantification of porosity. In addition, the software allows for automatic judgement of indications against standards or codes and defect tally list generation. Results are achieved on CD-rom which the customer can replay using a dedicated view program. Since 1989, an impressive track record has been built up whereby, Rotoscan was used as a sole inspection technique to the full satisfaction of all involved. The system can now be considered a mature inspection tool. Projects on diameters between 8", see Fig. 4, and 48", see Fig. 5, were completed. 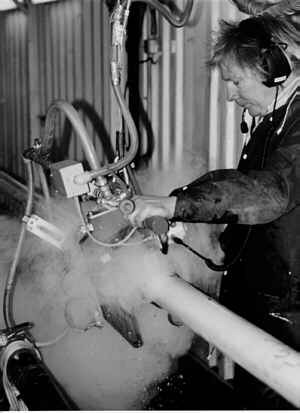 Some of the projects took place under harsh weather conditions, such as temperatures as low as -40°C. With the current Rotoscan system, a typical cross country production rate of over 120 welds a day is achieved at projects where automatic welding is applied. 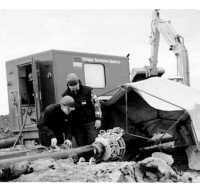 A two men crew operates the Rotoscan, whilst a third assistant adjusts the guiding bands and cleans the pipe surface adjacent to the weld. At the moment of this presentation, sixteen self-contained Rotoscan units are available for commercial application. From qualification trials and field experience, some advantages relevant to lay barge application have become obvious. Not only is inspection time independent of wall thickness and can cycle times of four minutes easily be coped with, but in addition no equipment is needed inside the pipe, hence no interference with the critical production process exists. Last but not least, no radiation sources are needed. Although these advantages have become clear for lay barge application, practice has shown that this area of industry is hesitant to embrace this development. This might be caused by the deeply rooted tradition of radiographic inspection. It seems however, that recent successful qualifications and commercial lay barge jobs have demonstrated that a new era in pipeline girth weld inspection has begun. After a clear breakthrough for cross country pipelines, Rotoscan is now mature for use on lay barges. Apart from its performance in terms of defect detection and ease of interpretation, this is also because of the system's ability to cope with typical lay barge conditions such as strong electromagnetic interferences and elevated weld temperatures (up to 200°C). For example amongst other successful offshore applications early 1996 the Rotoscan was applied on a lay-barge, see Fig. 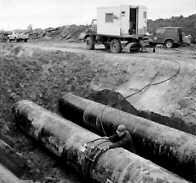 6, to inspect a 3" pipeline at a rate of up to 360 welds a day. It successfully replaced double wall single image radiography as a more efficient and economic alternative. At present work is in progress to qualify the system to inspect radial friction welds. On the various projects, a variety of inspection codes and acceptance criteria were applied. These included both ECA and Good Workmanship standards. In practice it was experienced that, although the POD of relevant defects of mechanized UT is generally higher than for Radiography , repair rates appeared to be normal, sometimes even lower than typical RT values.This indicates, that high POD values combined with low false call rates are achiev-able under practical conditions. This even applies for manually made  and narrow gap welds. In particular the Cscan mapping is esse-tial for the system to cope with these weld geometries. It was also proven that the Roto-scan can cope with even excessive hi-lo, for which it has deliberately been made in-sensi-tive to prevent false-calls. A very important part of ultrasonic inspection is the sensitivity setting of all the individual ultrasonic transducers. Sensitivity setting is done by means of a calibration plate made from a piece of the actual pipe, to ascertain that dimensions and chemical composition are identical to the pipe to be inspected. This pipe segment contains machined artificial defects, such as flatbottomed holes and notches related to applicable code or specification requirements. Each zone of the weld to be inspected has its specific calibration reflector(s). Two sets of calibration reflectors are provided, one set for each transducer set at either side of the weld. The calibration plate is inserted in a larger pipe segment, which has a band attached to it to guide the Rotoscan scanner. This method of calibration not only enables setting of sensitivity for each individual probe, it also allows for rapid dynamic check of Rotoscan's performance at inspection speed. In practice, this plate is used for regular calibration checks and to store the scanner during transport between welds. Figure 7 shows the calibration plates on its usual place at the back of the allterrain vehicle. For application of the Rotoscan, it is good practice to operate strictly accoring to a mutually agreed inspection procedure. To judge the results, the procedure always contains clear acceptance/rejection criteria. These criteria may be based on an "Engineering Critical Assessment" . Applied fracture mechanics appears to result in appropriate criteria, which are very pragmatic to work with. However, the system is also increasingly used on projects where good workmanship criteria are applied, which typically require detection of smaller anomalies than ECA based criteria. This has been made possible by the fact that the improved technology (mapping facility) now enables unambiguous signal interpretation. It is to be expected that due to the higher defect detection probability with mechanized UT, rejection criteria will eventually be adapted to specific UT capabilities and will differ from current conservative (good workmanship) criteria, which have been typically designed for use with radiographic techniques. Nevertheless there is hardly any progress to agree on generic international acceptance criteria to introduce mechanised UT. Efforts sofar were not successful. This has resulted in a new initiative: at present a joint industry project embraced and supported by IPLOCA is in progress to establish and introduce such criteria restricted to pipeline girth welds. RTD was contracted by PRCI (formerly Ameri-can Gas Asso-ciation, AGA), for the performance of a systematic study to evaluate the reliability of mechanized UT. A number of welds, both manually and automatically made and containing intended defects, were incorporated in this study. This work is limited to performance in the weld's root region. It is particularly this weld region, where appropriate solutions are essential to unambiguously discriminate between relevant weld defects and geometry. Results confirm, that Rotoscan indeed offers the proper reliability . A second contract is just completed for AGA/PRCI to perform a similar study for the weld body. This includes capabilities to detect and quantify planar defects and, most difficult for UT systems, voluminous defects such as porosity . The present Rotoscan is capable of achieving a high Probability Of Detection (POD) together with a low False Call Rate (FCR), appropriate flaw sizing capabilities and recording of results. Used with prag-matic acceptance criteria, e.g. based on still individual Engineering Critical Assessment, the system is now a mature alternative to radiography both on- and offshore. The increased use of thin-walled, high-grade steels justifies the use of ultra-sonics in combination with adapted acceptance criteria. The system can easily cope with typical production rates, also on lay barges. The use of Time Of Flight Diffraction (TOFD) technique in addition to the standard probe configuration including for detection of transverse defects contributes to the reliability of detection and sizing of defects. B. Gross, J. O'Beirne, B. Delanty, Comparison of radiographic and ultrasonic inspection methods on mechanized girth welds, Pipeline Technology Conference, Oostende, Belgium, October 1990. J.A. de Raad, Can Mechanized UT Replace RT on Girth Welds during Pipeline Construction? International Conference on Pipeline Reliability, Calgary, Alberta, Canada, June 2-5, 1992. J.A. de Raad, F.H. Dijkstra, Mechanized UT now can Replace RT on Girth Welds during Pipeline Construction, Second International Conference on Pipeline Technology, Oostende, Belgium, September 11-14, 1995. A.G. Glover e.a., Inspection and Assessment of Mechanized Pipeline Girth Welds, Proceedings of Weldtech 88, London, U.K., 1988. 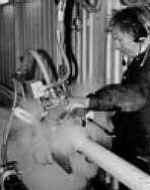 A. Glover, D. Hodgkinson, D. Dorling, The application of mechanized ultrasonic inspection and alternative acceptance criteria to pipeline girth welds, Pipeline Technology Conference, Oostende, Belgium, October 1990.